On Sunday May 22, I organize a hike to the Rochers de Salin 1846 m.
Situated at the back ground of Bargy chain, these discrete little rocks offer a quiet, isolated and beautiful views over its surroundings. We start from Petit Bornand (La Ville, about 40 km from Geneva). We walk on GR 96 in the forest, Chalets De Mayse and go up to Col De Forclaz (overlooking the Lac De Lessy). Here, we walk on the ridges and arrive at summit. Cumulative elevation gain: about 1040 m. Distance about 14 km. For pretty experimented hikers. 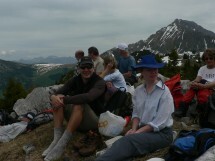 Equipment: Good shoes, gaiters, hat, gloves, warm and waterproof clothes, sticks, picnic, drink. All participants must be well-prepared and have all equipment with them. The hike is organised by the small hiking association Oxygene 74 http://assoc.pagespro-orange.fr/rando-74 There is a participation fee of 5 Euro for a daily license of the French hiking federation FFRP.